In the gym, one of my favorite arm exercises is the triceps dip. I never really found a great way to do them at home that wasn't either dangerous or destructive to furniture. Enter the Lebert Equalizer, a solidly constructed metal set that brings many gym exercises home with you. The Equalizer arrives in a few pieces that are quickly and easily assembled with the included parts. Total assembly took, maybe, seven minutes to get both of them up and running. 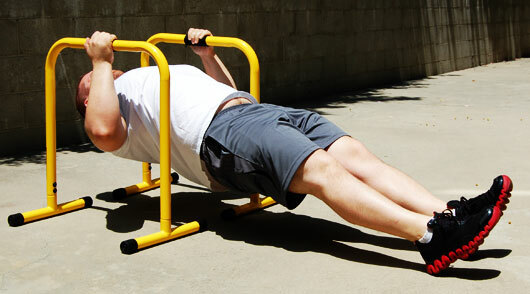 Included with every set is a poster of exercises you can do, though may absolute favorite is the venerable push-up. By laying the Equalizer on the ground you get a great push-up variation. 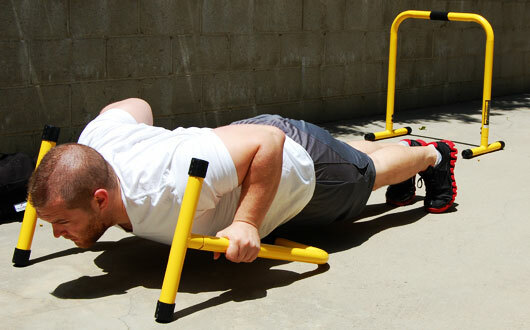 You can also use the unique shape of the product to add a real challenge to your floor routine – do strong push-ups, throwing yourself into the air (like a clapping push-up) and hop over the bar. Do it again to the other side. Do it again back. Trust me, you'll tire out quickly. The highlight exercises capable with the Equalizer are the knee-ups (abdominals), tricep presses (duh), and the rows (back). There are at least two dozen different things you can do with the Equalizer, many of which can't be replicated with chairs or whatever is laying around your house, which makes them a worthwhile investment. If you're feeling crazy, there are plenty of strange balancing moves you can do in presses, pushes, and tricep moves but hey, if you injure yourself, that's not my fault. 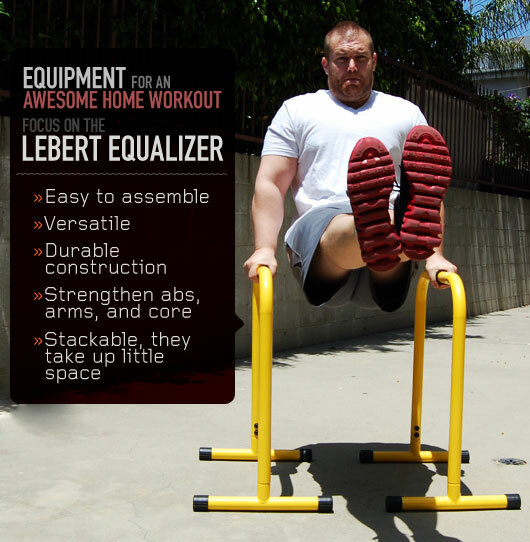 The Lebert Equalizer retails for $99.99 and comes with the two units, a poster of exercises, and instructional DVDs. The Equalizer is my favourite strength training tool. It’s so compact and versatile – in just a few minutes, I get an amazing full body workout, right in my own living room or backyard! The endless variations on pull-ups, push-ups, tricep dips, lunges, squats, and other core exercises allow (and encourage!) me to constantly challenge myself. I have seen incredible results using the Equalizer, and it continues to be part of every one of my workouts – highly recommended!